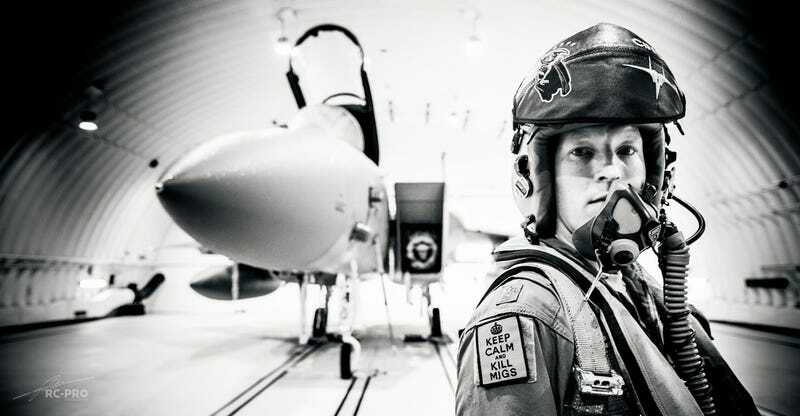 Master photographer Rich Cooper recently embedded with the 493rd Fighter Squadron “Grim Reapers” based at RAF Lakenheath in England to capture day-to-day operations of the famed F-15C/D Eagle unit. The results of which are the series of haunting photos laid out below. The Grim Reapers are the only dedicated USAF air superiority squadron forward deployed to Europe and their F-15C/Ds have been very busy since Russia invaded Crimea over a year and a half ago. The Grim Reapers’ roots date back to World War II and they were on the front lines of the Cold War flying various aircraft types. In 1986, the squadron put their F-111 Aardvarks to use by taking part in long-range bombing raids on Libya during Operation El Dorado Canyon. Over a decade later, the squadron scored a whopping four kills against Serbian MiG-29s during Operation Allied Force. Today, the squadron remains the “tip of the spear” of American air power in Europe and has been extremely active training with NATO allies under Operation Atlantic Resolve. Even though the squadron is striving, it’s slated to be deactivated sometime in the not-so-distant future. The two F-15E squadrons that serve alongside the Grim Reapers at Lakenheath as part of the 48th Fighter Wing will continue to operate after the Grim Reapers have gone. As such, these very well may be the twilight years for the famed squadron, at least as we know it today. Two F-35A squadrons are supposed to be activated at RAF Lakenheath around the year 2020, but like all things F-35, this could change and there is no certainty that they will take up the Grim Reapers’ name and lore. Make sure to like Rich’s Facebook page and check out the Centre Of Aviation Photography homepage, a fantastic organization he founded that offers photographers incredible aviation photography experiences. Bonus! Below are some shots of the 48th Fighter Wing’s F-15Es blasting out of RAF Lakenheath on night training missions.